Home › Fuel Protests › Fuel protesters keep up the pressure, Stanlow Refinery targeted tonight! 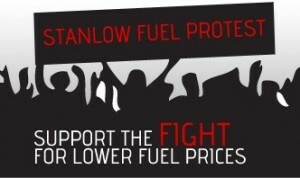 The fuel protesters targeting Stanlow Fuel Refinery will again be out in force this evening to ensure the fight against unfair fuel prices is kept alive. The planned “Go Slow” and protest will begin tonight at 7:30 sharp this evening at Chester Services on the M56 J14 (CH24QZ). As fuel prices sail through the £6 a gallon mark, protest groups have seen a great deal of interest and public support. Attendance is thought to be even stronger for this evening’s event with nearly 150 people signed up to join the campaign. We urge you to show your support for the fight against fuel prices in anyway you can. Please see the Stanlow Fuel protest Facebook page back for more information on this and other upcoming protests in the area. I am totally against the amount of tax added to fuel and the price of diesel which was cheaper than petrol a few years ago but is 7p dearer. I am interested in protesting in my area as everybody just accepts these rises and the government could wipe out there debt,save local authority jobs and have surplus money left over to cut the price of fuel substantially by having a land tax, but the government decides to keep cutting council jobs and increasing taxes to those who are on small incomes.